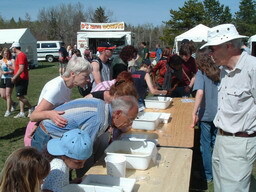 Earthday 2005 was celebrated on Sunday April 24 at Hawrelak Park. Volunteers Megan Stoker, Erin Cameron, Dan Stoker, Bruce Cameron and Miles Constable set up and tended the BLESS displays throughout the day. 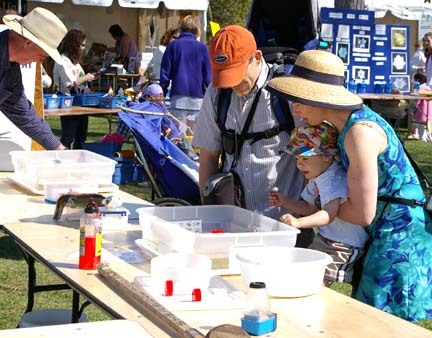 The display and games were a huge success with the aquatic life part by far the most popular. Thanks to Megan, Erin, Miles, Bruce and Dan for the time, energy and effort they contributed, once again, to this important yearly event. Here's a look at some views of the Earth Day event at Hawrelak Park where BLESS had some fun with displays and activities with the public. The layout for the event ... A huge map showed the size of Big Lake and the new Lois Hole Centennial Provincial Park. On the left, a 'frog toss' game was set up. In the background, the tables with the aquatic organisms were on display. 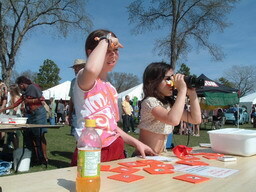 Kids play animal identification game using binoculars. 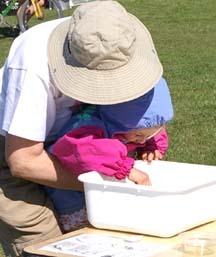 Erin and Bruce Cameron help out at the aquatic identification tables.